With 20+ years of experience in the corporate world I learned the many, many benefits Yoga has to enhance the quality of work life and balance in demanding stressful environments of business. Corporate Yoga is growing and being embraced by many businesses. Chaitanya Yoga offers practices from slow and meditative to energizing and active. 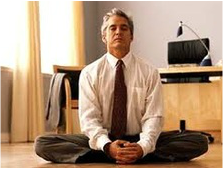 We will get to know your staff and find out the type of Yoga practice that is most needed for your employees. Yoga provides the benefits of relaxation/stress management training and fitness. Improved work life balance could have a powerful impact on both overall culture, performance and costs. Incorporating yoga at your workplace inspires a team to be connected, calm, productive. Now a group of researchers at Boston University School of Medicine believe they’ve discovered yoga’s secret. In an article published in the May 2012 issue of Medical Hypotheses journal under an impossibly long title, Chris Streeter, PhD, and his team hypothesize that yoga works by regulating the nervous system. And how does it do that? By increasing vagal tone—the body’s ability to successfully respond to stress. The Study: The Effects of Yoga on the Autonomic Nervous System, Gamma-amino butyric-acid, and Allostasis in Epilepsy, Depression, and Post-traumatic Stress Disorder. What Is Vagal Tone? Most of us don’t even know we have a vagus NERVE that needs toning, but we most certainly do. The vagus nerve, the largest cranial nerve in the body, starts at the base of the skull and wanders throughout the whole body, influencing the respiratory, digestive, and nervous systems. Often thought of as our “air traffic controller,” the vagus nerve helps to regulate all our major bodily functions. Our breath, heart rate, and digestion—as well as our ability to take in, process, and make sense of our experiences—are all directly related to the vagus nerve. We know when the vagus nerve is toned and functioning properly because we can feel it on different levels: Our digestion improves, our heart functions optimally, and our moods stabilize. We have an easier time moving from the more active and often stressful states of being to the more relaxed ones. As we get better at doing that, we can manage life’s challenges with the right blend of energy, engagement, and ease. When we can consistently maintain this flexible state we are thought to have “high vagal tone.” ...low vagal tone is correlated with such health conditions as depression, post-traumatic stress disorder, chronic pain, and epilepsy. 1.Keeps You warm. When the temperatures drop, it’s hard to activate your metabolism. Yoga counters the cold by heating the body gradually. Yoga helps circulation and keeps hands and feet warm. Plus, when you’re tempted to go into “hibernation mode,” its slow moves aren’t jarring. 2. It Boosts Your Immune System.Yoga raises blood oxygen levels and keeps the circulatory system working properly. With higher oxygen levels in the blood, your body is better able to fight off illness or infection. 3. It Helps Prevent Winter Weight Gain.Between comfort foods and weekends feasts, these are ‘times of testing’ for those who watch what they eat. Plus, there’s less opportunity to do outdoor physical activities. Yoga can spark your metabolism into action. 4. You Need an Indoor Activity.Yoga can be done in a studio, and it can help you beat cabin fever. Yoga helps let the mind wander or takes you to another place. It can give you the inspiration you need to get you through the darkest hours of winter by helping stimulate your mind and soul. 5. You’ll Breathe Easier. Do you find yourself short of breath in winter, especially when the wind chill drops to freezing temperatures? Yoga improve respiratory function and is known to correct asthma related symptoms such as shortness of breath. Practice breath with each yoga pose. 6. Prevents the Winter Blues.Winter is a drag for your brain but yoga is a source of positivity. Yoga can make you happy, healthy and ready to take on the challenge of winter by providing an opportunity to meditate and escape from the everyday drudge into a tranquil place inside your mind. Brighten your winter! 7. Improve your skin's circulation and natural health by sweating it out in the yoga room.Get flexible, avoid stiff, sore muscles that are clenched from the cold. Relax instead. 8. Enjoy interaction with friends, fellow yogis, and instructors at your studio. The best way to beat the blues is to talk through whatever's on your mind, and you will make real friends who you can trust if you open up. Adopt a 'Namaste' state of mind. 9. You'll meet that new year's resolution of taking care of your body. And you'll work every muscle, tissue, organ and system you've got, looking like a Goddess in the spring. 10. If you can, you must! Headstand (Shirshasana) is often referred to as the king of all asanas. Here are 10 reasons why headstand should be practiced everyday, for a minimum of 5 to 10 minutes. 5. It's great to improve memory, to tone the nerves/neurons, most seniors in their old age, have a perfectly healthy mind and body, without all the diseases that we believe are inherent to old age. Although I recommend learning headstand from a qualified teacher, its multifaceted benefits should not be ignored. Headstands is not indicated if you have spine or neck njuries, extremely high blood pressure, ear and eye problems, if you are menstruating, or have acid reflux. It is also not indicated to absolutely beginners, a minimum 4 month of yoga practice being considered safe, before attempting this asana. This is the title of a program used to treat cancer patients in over 250 hospitals in the U.S. and Canada, including medical universities such as Duke, Stanford, Pittsburgh, University of California in San Francisco, University of Washington , Wisconsin, Toronto, etc.., but also in hospitals in Europe (Germany, Netherlands, Sweden, Norway, Belgium, Switzerland). Dr. Kabat Zinn, quoted by Dr. David Servan-Schreiber in his book "Anticancer" taught Meditation for over 30 years and believes that we should spend at least one 30 minutes every day with ourselves, because this means to love yourself, with great effects on health ( we expect love from others but we’re not used to give ourselves what we ask from, or what we give to others ). To stay away from television, email and telephone is a kind of positive attention to your self. Countless studies have shown that meditation has some of the most surprising effects on the body and mind of humans. After a month of meditation, 30 minutes per day, significantly increasing the number of NK cells, which means peace of mind through meditation stimulates the immune system. At the same time, available meditative and peaceful encounter with yourself known phenomenon reduces the "chatter of mind" (our minds are always alert and full of turmoil) and the result is a restoration of cardiac coherence or harmonious connection between heart and brain. If scientists use the program to reduce the stress which causes cancers, we can use a similar program without suffering from cancer, when the heart feels tired, we feel depressed, anxious, sad, angry, have insomnia, etc. Practicing meditation therapy by focusing on breathing and ignoring any thoughts that may occur, we can reduce the stress, feel better, love ourselves more and perhaps replace a long list of drugs. Stress is simply the result of falling into the world, whithout paying attention to come back to you again, an intense living in the world whithout having anymore your own inner center strength. Stress is a symbol of anxiety and negative concentration of our attention on life, in a negative manner. Stress is telling us that we remove ourselves and avoid conscious encounter with the inner source of healing hidden in our body. “A Quiet mind send a quiet signal to all the organs “ as a distinguished neurologist said. Even a week of meditation manages to have remarkable physiological effects, but the habit of daily meditation, at first only for five to ten minutes is a sign of wisdom and love for ourselves. It’s a sign that YOU understand what you read, have discernment and can chose for you, you are intelligent. We see now that if peace on mind stimulates immunity, evidenced by increased NK cell in the body and, if 80 percent of people have immunity problems, means that stress is more prevalent and more dangerous than we like to accept ( or we simply ignore because we don’t have the necessary education, knowledge about what is good for health and what not. Life problems are inherent, they will always appear and that’s is why we find in meditation, in prayer and concentration, our positive way to stop irrational expectations that makes us believe that peace is found only by solving our life problems .We can find peace by turning the attention to ourselves even for a few minutes every day, by meditation. We will feel connected to life, more calm and intuitive, able to accept the problems as they are and fix them, and the body become stronger in being able to fight viruses, bacteria and pollutants which intoxicates us. Peace of mind by meditation or by physical yogic movement, through communion with nature is actually our ally against disease, stress and problems. Knowing is power, and acting is intelligent choice, remember. WHY SHOULD YOU WAIT TO BE ILL, IN ORDER TO TAKE ACTION? ISN'T SMARTER TO PREVENT?! Want to enrol in an intense period of yoga trainning? Go to our Contact page and send us a message. You'll be soon contacted back by one of our staff members. HOLISTIC LIVING - HOW DO WE BRING HEALTH AND BALANCE INTO OUR LIVING SYSTEM? First, by attending to the Ether element — the mind. If your mind is bogged with too many impressions and thoughts, and it is draining you of your resistance power, that is where it is preparing your body for some disease. If the mind is clear, calm, meditative, and pleasant, the resistance in the body increases and it would not allow a disease to come into the body. The first remedy is calming the mind, coming from the subtlest aspect of creation, the Ether. Then comes the air element - the breath. Aromatherapy and some other techniques come in this category. Next is the light element; here comes the color therapy. Before a disease manifests in the body you can see it in the aura of a person. By energizing our system with Prana or life energy, one can clear the aura and prevent the illness. That is what yoga does. The purpose of yoga is, to stop the sorrow before it arises. To burn the seed of sorrow before it sprouts. Then comes the water element. Fasting with water or purifying the system with water can bring a lot of balance in the system. The final recourse is different medicinal herbs, medicines, and surgery. All this comes when everything else fails or when we neglect these other steps. Taking care of ourselves, means honoring our selves, having self respect for what and who we are. We can appreciate menopause as our special time for physical, emotional, and spiritual reassessment. We can take responsibility for how we want to live the rest of our lives and honor who we are. While there is certainly a time when extra psychological, hormonal, and spiritual support is invaluable, there is also an invaluable gift to us from India - a rejuvenating, relaxing, energizing, revitalizing "Fountain of Youth" called Yoga. With Yoga, we can balance our energies physically, emotionally, and spiritually as we go through menopause. Yoga balances the endocrine system which controls your body's production of hormones and it calms the nervous system, reducing stress and aggravation of hot flashes. Yoga is a weight-bearing exercise which strengthens your bones and prevents osteoporosis. It can massage the reproductive organs, relieve pelvic congestion and headaches, boost the immune system, reduce fatigue, and even out mood swings. Deep breathing oxygenates the blood, which cleanses the organs and respiratory system and nourishes the nervous system. Yoga creates more strength and flexibility in your body, calms your mind and creates a more centered feeling in your heart. Yoga soothes, balances, and rejuvenates all our parts, bringing us to wholeness, allowing us to shine. Just an hour of Yoga three times a week is enough to make a difference. If you can make a commitment to yourself to take two or three classes a week for a month, then assess how you feel, you'll surely notice the difference. The benefits of a Yoga practice have been demonstrated by now, responsible and highly professional medical doctors recommend it (ask your doctor) ...and know that Yoga works… if you do it! Renounce at the wrong assumption that with age is normal to feel pain, unhappy, and tired. Ageing has nothing to do with deseases and unhappiness. Only lack of caring for yourself, lack of loving yourself, not paying any attention to your personal needs makes you so. Try practicing yoga and you'll see yourself restaured and rejuvenated in your body, mind and soul, as to live your life being grateful you are alive. Remember when you were young?! Well, try ! Want to start your yoga practice with us? Go to Contact us page and send us a message. We'll comeback to you with all the details you need promptly. But these enormous physical benefits are just a “side effect” of this powerful practice. What yoga does is harmonize the mind with the body and this results in real quantum benefits. It is now an open secret that the will of the mind has enabled people to achieve extraordinary physical feats, which proves beyond doubt the mind and body connection. Improve memory, concentration, blance of mind, reduce stress - Yoga through meditation works remarkably to achieve this harmony and helps the mind work in sync with the body. How often do we find that we are unable to perform our activities properly and in a satisfying manner because of the confusions and conflicts in our mind weigh down heavily upon us? Moreover, stress which in reality is the #1 killer affecting all parts of our physical, endocrine and emotional systems can be corrected through the wonderful yoga practice of meditation. In fact yoga = meditation, because both work together in achieving the common goal of unity of mind, body and spirit – a state of eternal bliss. The meditative practices through yoga help in achieving an emotional balance through detachment. What it means is that meditation creates conditions, where you are not affected by the happenings around you. This in turn creates a remarkable calmness and a positive outlook, which also has tremendous benefits on the physical health of the body. These are just some of the tangible benefits that can be achieved through yoga. Having seen this, it is educative to note why the ancient yogis performed yoga and the interdependence of yoga and meditation. The ultimate goal of the yogis was “self realization” or “enlightenment”, a concept, which perhaps is quite esoteric to you and me. But what is interesting is that for this they had to meditate for extensive spells of time – days,weeks and much more. This required tremendous physical fitness, energy and the capacity to subsist on next to nothing. Yoga positions or asanas provided them the fullest fitness with the least metabolism or stress and meditation in turn provided them the strength and will to perform these asanas effectively – a virtuous cycle of cause and effect. This mutually symbiotic relationship helped them in their path. OUR ADDRESS: UNIT C106, SANDOWN SQUARE, SANDOWN ROAD, PARKLANDS, CAPE TOWN. FOR INFO CALL 0836329434.